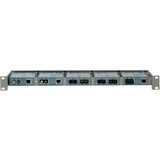 The FlexPoint 5-Unit Rack Mounting Shelf holds up to five stand-alone FlexPoint media converters. The converters are individually-secured utilizing the same hardware as in the FlexPoint Powered Chassis. Each converter is also individually-powered in order to provide a low-cost solution for a small installation.